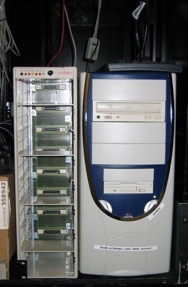 This is the old web server, sitting here in the cabinet on the right. I remember when it looked so new and compact and shiny to me. Oh man. I should put together a small collection of pictures of the hardware of Echo. We’ve been around for 18 years. We went from a computer sitting underneath my desk at home, to a bunch of computers in our own gorgeous offices in Tribeca, to these two thin, sleek machines sitting in a co-location site, with a bunch of other machines belonging to God knows who and NO people. It’s a very spooky, 1984-type place. 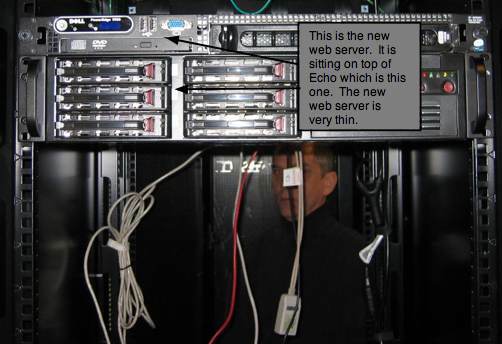 But below is the new server, sitting on top of the machine that runs Echo. That’s Joe from Panix in the back, hooking up the server to the world. I’m also learning how to insert text boxes and arrows and whatnot. What do you think? I think I need to go back to the drawing board. I could make it clearer, and more aesthetically pleasing. Expect to see text boxes and arrows in my photographs for a while as I learn to get the hang of them. Anyway, I’m sure one day these sleek, thin machines will eventually look old and clunky to me, too. As we all will one day look old and clunky to ourselves. Except it’s not a good analogy. Whereas we all really will be old and clunky, the machines don’t change, only our perception of them.